One of the most powerful sources of genealogical information on the face of the earth is the military pension file. Chock full of detail on everything from the military service of the soldier or sailor himself to the details of his family, military pensions often give us insights into family history that just can’t be found anywhere else. So it’s no wonder that any genealogist — The Legal Genealogist included — is thrilled to find the name of an ancestor or collateral relative on any list of those who were awarded pensions for military service. Where we occasionally go wrong, however, is in not pursuing the matter all the way when we think that a family member was alive at a time when he or she could have applied for and received a pension — but we don’t find the name on the pension list. Because not everybody who applied for a pension got it. And the records created when someone didn’t get a pension are still well worth the effort of tracking them down. Here’s one clue to getting into those records that you might not have thought of before: the Decisions of the Department of the Interior in Appealed Pension and Bounty-Land Claims. 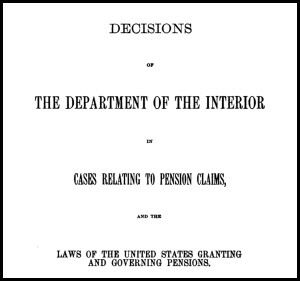 And — starting in 1887 and running through to 1930 — the Department of the Interior prepared and published its decisions in appealed cases involving military pensions. There were 22 volumes of decisions published and a quick online search turns up all of them, digitized, online, free. The best collection is at HathiTrust Digital Library, an online partnership of academic and research institutions, where you can find all but volumes 19 and 21-22 in full text in this collection from the University of Michigan. Volume 19 is at HathiTrust as well, in the collection from Harvard University, and the last two volumes (21-22) can be found here in the collection from the University of California. You can also find some of these volumes digitized online at Google Books and at Internet Archive. So… what might you find in one of these volumes? Well, the most important thing you might find is the name of one of your relatives — someone who either applied for a pension and was denied, or who was a family member of a soldier ot sailor or a witness who just happened to be mentioned in the course of the opinion. Finding that reference can alert you to the fact that there’s a file out there that needs to be obtained and reviewed. And although the opinions themselves tend to be brief and provide only snippets of information, those snippets alone can be pure gold. Even when a pension application is turned down, the facts you may find may be appealing indeed. Sometimes people say to me, “I don’t think I’ll order that pension file since it wasn’t approved,” and I always respond that I’ve often found *more* information in the files that weren’t approved than the ones that were! As one example: One of the fathers in my tree applied for a parent’s pension about 15 years after the Civil War ended. Not surprisingly given the lag time, his pension application was denied. A number of members of the family were incensed at this, and he and some of his adult children & sons-in-law continued to give affidavits and write angry letters to the Bureau up until his death a couple of years later. The file provided a great insight into their family dynamics in addition to providing a goldmine of genealogical information. Oh you are SO right: there will often be more in a disapproved file than an approved file! We need to get them all. There was a widow’s pension in that case issued in 1928. The records may not yet have been turned over to the National Archives. You’d need to make a Freedom of Information Act request to the Veterans Administration, and probably need proof of the widow’s death. I made an unsuccessful FOIA request for a Civil War pension file (neither NARA nor the VA could find the file) and then contacted NARA-DC again a couple years later. NARA-DC confirmed that they did not have the file but told me that some of the VA files had been transferred to the St. Louis NARA and that they were not told about it until after the fact, so that my file may have been in transit from the VA to St. Louis when the VA was unable to locate it. They now suggest that researchers write to St. Louis NARA to see whether the file is there before making a FOIA request at the VA. St. Louis asks that people submit requests for recently transferred Civil War pension files in writing, including as much relevant information as possible. Hopefully at some point this will become less of a maze for researchers. My vet in this situation died in 1927 and there were no dependents left to draw his pension, so the file should have been closed in 1927, right around the time of the open/closed cutoff. Absolutely do not give up on that pension file. It may be hiding. I had a fellow who served and was disabled in the Mexican War. He got a bounty land warrant in the 1850s, so there was some paperwork when he sold his warrant to the person who actually patented land based on the warrant. And even though his pension application, and that of his widow, were clearly listed in the index to pensions, NARA could not find the folder for his Mexican War pension. That first search effort was in the 1990s. I kept inquiring about every 2 or 3 years. No joy. Then last summer, I went in person to NARA. I looked at a lot of pension files, and asked again for a search for my fellow. Again, not found. But my fellow had asked a congressman to help with the pension, so his name was listed in the Congressional Record. The expert in Legislative Affairs even allowed me to look at 1880s petitions to Congress from soldiers – the actual petitions! While I was biding my time searching those petitions, the NARA employees were quietly continuing to help me. I guess the fact that I’d wanted the file since the 1990s made a difference. So a NARA expert – a fellow who had worked there for decades but who actually is in another division now – went to the stacks yet again. I learned family facts that nowhere else could have been discerned. And even learned that the mother of said soldier – a woman born in the 1790s – was yet alive in 1888. These volumes are also on Ancestry.com. Thank you for your timely post as I was just searching through your archives on this topic. Would the materials in the military pension file and military service file from NARA be copyright-free? I have received both files for a Spanish-American War vet (which amazingly included letters from him)! I am doing a family history scrapbook and wanted to include images of some of the items in those files. Thank you! The usual answer: it depends! Any of the government documents likely are not copyrighted; anything written by the service member could be copyright protected if he has not been dead for 70 years. Whether your use would be a fair use, even if the item is copyrighted, is for you to decide on careful review of the facts. Thank you! My service member sadly died during that War so it’s been well over 70 years. Military pension files are now one of the first things I try to get on ancestors. I requested the Revolutionary War pension records of my ancestral grandfathers. One gave details of his time at Fortress West Point and as it turned out, he was sent to chop wood, with many of the men, up the Hudson River so that as few men as possible were at West Point when Benedict Arnold turned. The other ancestral grandfather’s pension file indicates that he was granted his pension and received one payment. Then the government said wait a second, we aren’t paying any more pensions until you prove you are really impoverished and need the money. So all these men who had pensions granted had them rescinded, had to prove their need, and then within a couple of years, the majority were reinstated. Unfortunately in that couple of years time, my ancestor died. His widow continued to fight for a widow’s pension. I have copies of the letters going back and forth that were attached to his file. It is not only sad to see how the government ran this poor woman ragged to fight for this money, but it really disturbed me. In the end, the pension was granted but she died within months. It was also heart warming to see how neighbors, townspeople and her children helped her with the letter writing and and depositions as she was not able to read and write and in the end, was nearly blind. I also got so much more information from these files as well as 1812 and Civil War pensions. These were gold mines for me! Terrific that your ancestor’s pension file was so good! Many of them really are priceless.